EAST RUTHERFORD, N.J. -- The New York Jets lost another game, hardly headline news in their disappointing season, but they came away from their 10th defeat with a reason to be encouraged. 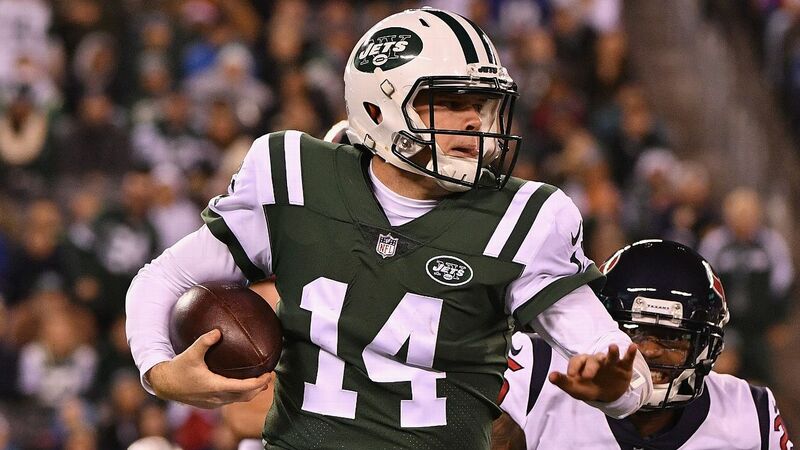 Rookie quarterback Sam Darnold, the present and future of the franchise, continued his late-season rally in Saturday night's 29-22 loss to the Houston Texans at MetLife Stadium. He threw two touchdowns, connected with nine receivers and sparked an injury-plagued offense to a near upset. "You're going to be a great pro," Texans star defensive endJ.J. Watt told Darnold after the game, according to video tweeted out by the Jets. Playing without leading rusher Isaiah Crowell and top receiver Quincy Enunwa -- both injured -- Darnold had no turnovers and improvised outside the pocket, flashing the potential that made him the third overall pick in the draft. "Phenomenal, he played phenomenal," Jets safety Jamal Adams said. "He's a competitor. I say that every week. He's a bad man, and the future is bright for him." At times, it looked as if Darnold was out there by himself. The Jets (4-10) aren't stacked with playmakers, and they had no business hanging around with Watt, Jadeveon Clowney & Co., but they pushed the AFC South-leading Texans to the 60th minute. Darnold led three long scoring drives, helping the Jets to a 22-19 lead onElijah McGuire's 2-yard touchdown run with 7:33 remaining in the game. For the second time in three weeks, the New York defense allowed a late touchdown -- another blow for embattled coach Todd Bowles. It is not expected that Bowles will keep his job once the season ends, but at least the organization has a foundation at quarterback. "I feel comfortable getting experience, and I feel like I'm seeing the field a lot better," said Darnold, who completed 24 of 38 passes for 253 yards on Saturday. Rebounding from a midseason slump, followed by a three-game foot injury, Darnold has looked like a different quarterback over the past two weeks, posting a 65 percent completion rate with three touchdown passes and only one interception. The time on the sideline gave him a chance to reboot. "When you sit out awhile, you get to sit back, and you learn a little bit," Bowles said. "He looks like he's learned quite a bit." The revamped Darnold orchestrated 83-, 60- and 73-yard touchdown drives against one of the nastiest front sevens in the NFL in the Texans. He made unplanned plays, including a 17-yard scramble that set up McGuire's touchdown. He might have had a chance to pull off an improbable win, butRobby Andersonfailed to haul in a fourth-and-15 pass. "I told him he's a good player," Watt said of Darnold. "He ran around all night, made a lot of plays on the run. He can scramble. He can make throws. He's a good player. Obviously, he's young and has a great future in front of him." For the second week in a row, Darnold and Anderson connected on an off-script touchdown. On a first down from the Houston 5-yard line, Darnold stepped up in the pocket and found Anderson in the back of the end zone. It wasn't as spectacular as last week's play, when Darnold scrambled 47 yards before finding Anderson for a 7-yard touchdown to help beat the Buffalo Bills, but the two young players once again demonstrated on-field chemistry -- something that was nonexistent early in the season. "I think it shows we have that connection," Anderson said. "We've got to keep building, but I think it shows a lot." On the next series, Darnold connected with seldom-used receiver Andre Roberts, who baited his defender with a slant-and-go. Darnold delivered a pinpoint pass into the corner of the end zone, sending a surge of electricity through the team and the stadium. "He played gritty and tough," Bowles said of his signal-caller. "We just didn't have enough plays to win the game." Sam Darnold throws a dime to the back corner to Andre Roberts for the 13-yard touchdown.